Let’s paint a picture of my typical Tuesday night. I flee from work as close to 5 as possible. Sometimes, I go wild and head for the elevators a few minutes early (4:53 to be exact). Then, I power walk to Penn station bobbing and weaving through hoards of tourists in Times Square looking up at billboards and taking pictures in front of the oh-so-picturesque Duane Reade. Once I hop on the 5:17 train, I can relax, read a book or fall asleep. Some LIRR train riders obviously missed the memo on relaxation. Every day, a loyal group of grumpies line up in front of the doors so they can spring from the train first, make a running beeline to their car and therefore arrive home 30 seconds before the rest of us suckers. I would love to catch this on video some day. It’s a real treat to witness. After navigating this complicated train evacuation and walking up a few flights of stairs to my car, I spiral down the parking garage and drive swiftly (but legally ;) to the gym. A quick costume change, and I’m ready for spin class (usually I remember to call and register before noon to secure a bike). Spin class is the highlight of my workout week. It’s fast paced and energetic. The music pumps, the teacher motivates and after a grueling hour of work I feel like I can do anything. I stretch out and head home. When I finally walk through the door it’s at least 8PM. I’ve been up since 5:15AM. 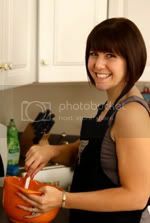 Who the heck wants to cook at 8PM? I’m sweaty and hungry. Hungry Trish can be a truly scary beast. EGGS IN PURGATORY is my response to hectic Tuesdays. You can make it in five minutes…literally. 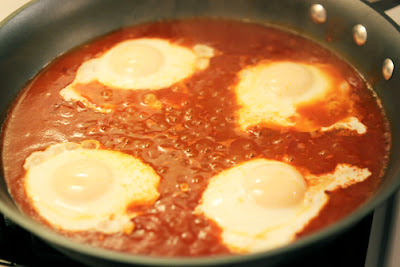 I wrote a recipe just to be as descriptive as possible, but really it’s just an egg poached in spicy tomato sauce. To stay carb free, I serve mine on top of a bed of sautéed escarole and white beans. But, a side of crusty Italian bread would be the perfect splurge accompaniment. If this is what Purgatory is all about, I wouldn’t mind hanging there for a while. I didn’t even know this dish existed. I was searching for ideas to spruce up eggs and stumbled on it. A recipe involving a strange reference to religion and the bible stopped me in my tracks. It’s such an odd title. Protein is essential after a workout routine. It helps to build up muscle tone. 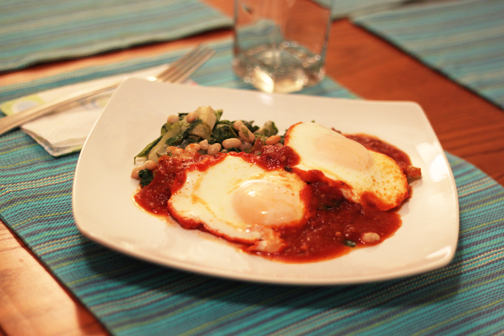 The spicy tomato sauce gives the eggs and unexpected kick. Anything that can taste this rich and satisfying and be on the plate in 5 minutes is a keeper in my book. If you have any super quick, post-workout food ideas, please share. I seem to over-complicate everything and can always use some guidance in the ways of simplification. I bet this would be delicious with a little Sofrito in it. That stuff has become my new favorite thing since I saw it on this site! This def looks like an interesting dish! I think I'm going to try it out! Looks like it would be a great Lenten meal! @Alexandre: Thanks for reading. Glad I could share a little slice of NYC (even if it's the aggravated commuter slice!) Perfect idea to use chipotle. I'm going to try that next time. Maybe top with a little cilantro. Yummm.